Living with a disability is far more difficult without an accessible home. However, not everyone knows their options when it comes to finding an accessible place to live. If you have a disability and are in the market for a new home, this is what you need to know. Posted on June 11, 2018 by Brian Mazzarella and filed under Volunteer Blog, Housing. Please join us in welcoming Kate Blisard to our ACI team! Kate, who started on December 1st, is our part time housing assistant. She comes to ACI with a variety of experiences in the disability field, including a rich background in advocacy. This includes: supporting those who wish to leave institutions and live in the community. Kate's recent positions were Disability Policy Consultant with the People and Disability Network, Coordinator for Seeking Way Out Together (SWOT), Community Development Specialist, The North Princeton Project, Rutgers University School of Social Work. Posted on January 9, 2017 by Brian Mazzarella and filed under Housing. Representatives from ACI's Advocacy Group recently met with Edison Township's Mayor Tom Lankey and Administrator Melissa Perilstein. Topics discussed were inaccessibility of some the of town's streets and sidewalks, enforcement of the snow removal law and housing. Thank you Mayor Lankey and Ms. Perilstein. Posted on September 24, 2015 by Brian Mazzarella and filed under Advocacy, Housing. 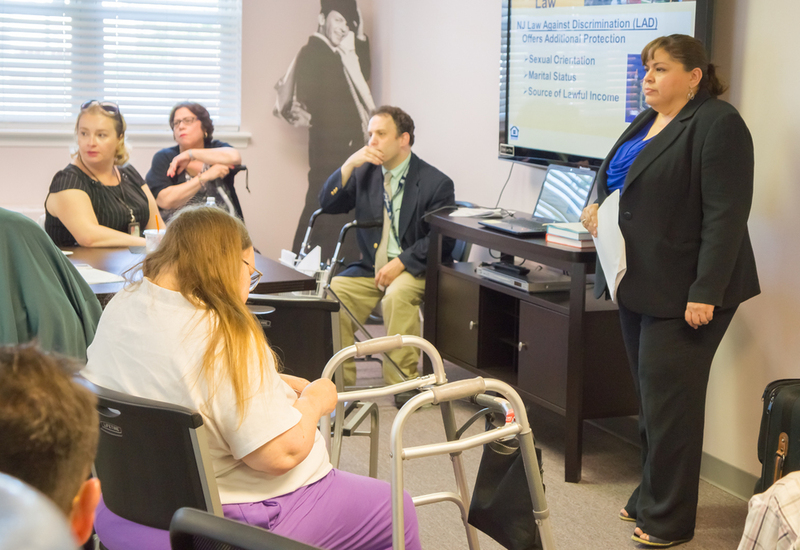 ACI hosted a very informative seminar on the federal Fair Housing Act and how it applies to people with disabilities. 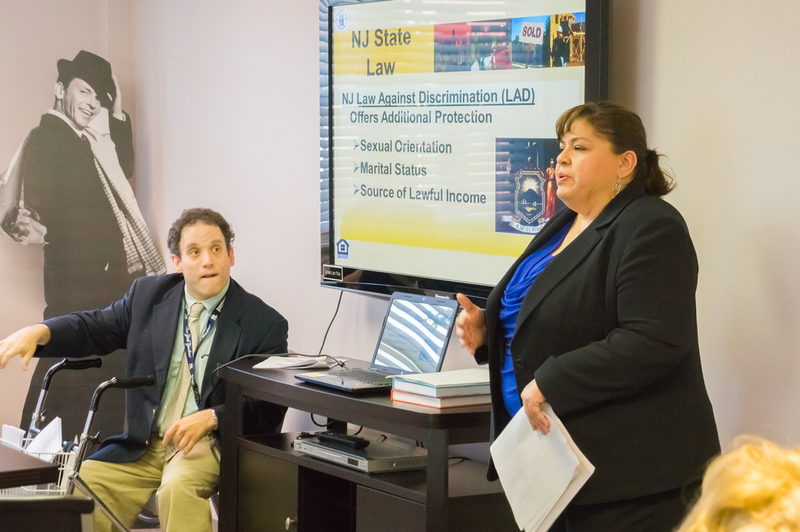 Presentations were given by Dinorah Velez and Wanda Nieves, both from the US Department of Housing and Urban Development, and Edward Haas, NJ Division on Civil Rights. We look forward to working with them on housing issues. Posted on May 15, 2015 by Brian Mazzarella and filed under Workshop, Housing. ACI, along with Portlight Strategies, Inc. and the Northern Ocean Habitat for Humanity, recently improved the accessibility in the homes of three New Jersey residents with disabilities. These improvements were made with the help of ACI's project director, Sue Pniewski, and financed with the help of the ACI Housing fund. Virginia on her brand new steps! Meet Virginia, a single woman who lives in Jackson, NJ. She is 76 years old and suffers from chronic, severe back pain, and it is because of this pain that Virginia is forced to use a walker to help her get around better. When she submitted her application to NOHFH, Virginia explained that she was in need of a better way to exit her home because she was so afraid of falling when she tried to use her walker. After discussing the options of either a ramp or widened steps with Virginia, she chose the steps because she felt the ramp would just be too much for her and she doesn’t feel she is going to require a wheelchair. Thanks to the partnership formed between Portlight Strategies, ACI and Northern Ocean Habitat for Humanity, Virginia is now able to safely exit her home with the assistance of her walker without fear of falling down her steps! Completed bathroom entryway, grab bar and sink. Meet the Marshall Sisters. Barbara is 72 years old and suffers from a broken left shoulder; her sister, Mary, is 76 years old and currently battling bone cancer that has left her unable to walk. When the Marshalls submitted their application to NOHFH in January 2014, they were requesting that the bathroom be made accessible because Mary’s wheelchair could not fit through the bathroom door. At the time they submitted, NOHFH’s A Brush with Kindness program had more applications than funding. Thanks to the partnership formed between Portlight Strategies, ACI and Northern Ocean Habitat for Humanity, Barbara and Mary can now safely and comfortably utilize their bathroom and shower! Posted on January 14, 2015 by Brian Mazzarella and filed under Housing. Edison, NJ, July 21, 2014 – The Alliance Center for Independence (ACI) is pleased to announce it has been awarded a $140,000 grant from the Hurricane Sandy New Jersey Relief Fund. The funding will be used to continue the Sandy Recovery Program previously administered by Portlight Strategies. The program provides financial assistance for home accessibility equipment, funding for the replacement of durable medical equipment and supplies, as well as counseling and referral services to disabled residents impacted by Hurricane Sandy. Portlight Strategies’ Sue Pniewski, will join ACI as the Sandy Recovery Program Project Director and continue her work out of The Visitation Relief Center in Brick, New Jersey. Posted on July 30, 2014 by Brian Mazzarella and filed under Emergency Preparedness, Press Release, Housing.